Weight loss is typically found during severe infections, e.g. septic arthritis. The aim of our study was to evaluate the role of leptin, regulator of food intake and energy expenditure, for the development of Staphylococcus aureus-triggered arthritis. Leptin production was found to be decreased during murine S. aureus-induced arthritis. Treatment with recombinant leptin neither restored the basal leptin levels nor affected the weight loss during the disease, but it significantly decreased the severity of septic arthritis. Exogenous leptin did not affect the staphylococcal load as measured in blood, joints and kidneys. Preceding the effects on joint manifestations, serum levels of interleukin-6 decreased in leptin-treated mice. In conclusion, the treatment with recombinant leptin reduced both the severity of joint manifestations in S.aureus-induced arthritis and the inflammatory response, as measured by serum IL-6 levels, without affecting the survival of bacteria in vivo. Leptin, the 16-kDa product of the obese (ob) gene  was originally described as a regulator of food intake and energy expenditure [2,3,4]. Leptin is constitutively produced by adipocytes  but may also be expressed in stomach, muscles, placenta and mammary epithelial cells . Rodents carrying mutation in the ob gene (ob/ob mice)  or in the gene for the leptin receptor, ObR  (db/db mice , fa/fa rats ), express an obese phenotype that, in the case of ob/ob mice, may be reversed by leptin administration . However, humans carrying a missense mutation in the leptin gene display obesity as one symptom of a complex syndrome , and leptin replacement is efficient for this subgroup of obese people . Like leptin-deficient humans, ob/ob and db/db mice show disturbed regulation of several functions besides weight control, including hematopoiesis, angiogenesis and the immune system. While ob/ob mice show defective T-cell responses , thymic atrophy  and a decreased level of circulating lymphocytes, they seem to be hyper-responsive to monocyte/macrophage-activating stimuli, and the level of circulating monocytes is increased fourfold . ob/ob mice and fa/fa rats show increased sensitivity to lipopolysaccharide, tumor necrosis factor (TNF) and IL-1, and reconstitution with leptin protects ob/ob mice from TNF-induced lethality . In mice, leptin production is increased by stimuli such as TNF, IL-1 and lipopolysaccharide [16,17,18]. 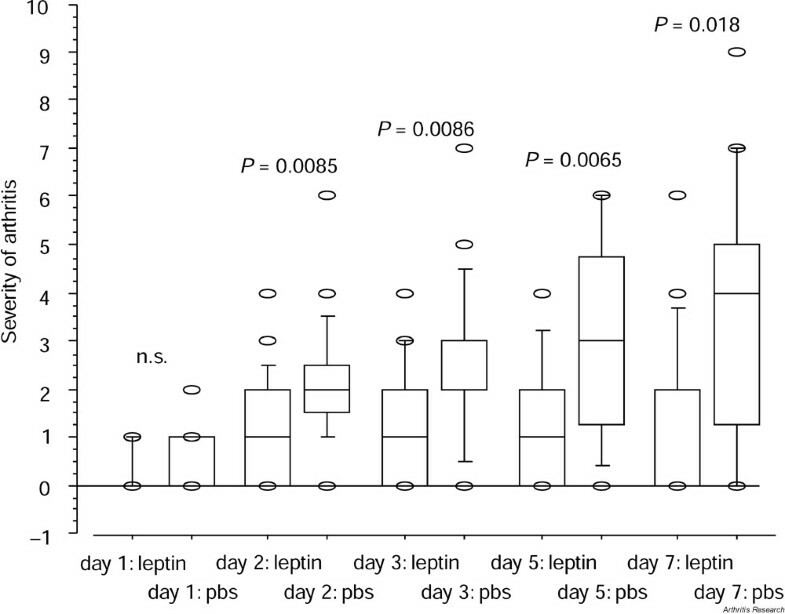 In rats, infection with Nippostrongylus brasiliensis results in increased leptin production . In humans, varying results concerning leptin production in septic patients have been presented [20,21]. Septic arthritis is a highly and rapidly destructive hematogenously spread joint disease, which usually produces sequelae in the affected person and can at worst cause death . The most common pathogen in bacterial arthritis is Staphylococcus aureus , which in patients with rheumatoid arthritis is the causative organism in approximately 75% of cases . While leptin levels do not correlate with disease activity in patients with rheumatoid arthritis , the impact of S. aureus-induced infection, or septic arthritis, on leptin production has not been investigated. We first measured leptin levels in NMRI and C57BL/6 mice before and after intravenous inoculation with S. aureus. Both mouse strains showed a decrease in leptin levels during the course of infection. The effect of leptin on the severity of S. aureus-induced arthritis is unknown. We therefore administered recombinant leptin to the mice during the course of infection. While the exogenously added leptin did not affect survival of the mice or bacterial clearance, the severity of septic arthritis was significantly lower in leptin-treated mice than in control animals. Male 5- to 8-week-old C57BL/6 and NMRI mice (B&K Universal, Uppsala, Sweden) were used throughout the study. Mice were housed, fed and intravenously inoculated as described elsewhere . For administration of recombinant mouse leptin (rleptin) (R&D Systems, Abingdon, Oxon, UK), the mice were given intraperitoneal injections of 0.2 ml twice daily (50 μg/mouse per day ), the first dose being given 2 hours before inoculation of bacteria. Control animals received phosphate-buffered saline (PBS). Intra-articular injections of rleptin were given in a knee joint in a volume of 30 μl containing 40 μg/ml. PBS was used as control injection. Experiment 1 was performed using 13 male C57BL/6 mice. Nine mice were each intravenously inoculated with 1.6 × 107S. aureus per mouse. Four control mice received PBS. The mice were bled at regular intervals and blood was collected on days 1, 8 and 11. In experiment 2, 20 male NMRI mice received 8 × 106S. aureus per mouse, given intravenously. Ten mice were given intraperitoneal injections of rleptin and 10 of PBS on day 0. They were bled on day -1, day 1 and day 8, and were killed at day 8. The kidneys were removed to check for the presence of bacteria, and the four paws were kept for histopathological examination. Experiment 3 differed from experiment 2 in that the mice were bled only on day 1, to check for the presence of staphylococci in the blood, and that the joints were checked for the presence of staphylococci on day 8. In experiment 4, the setup was the same as in experiments 2 and 3. The mice were killed on day 2 and the paws were kept for histopathological examination. In experiment 5, four male C57BL/6 mice were used. They were given an intra-articular injection of leptin into one knee and of PBS into the other knee, as described above. The mice were killed 3 days after inoculation and the knees were kept for histopathological examination. All mice were labeled and monitored individually. Their limbs were inspected by two observers at regular intervals. Clinical examinations for arthritis and histopathological examinations were performed as described elsewhere . To evaluate the intensity of synovitis and of cartilage and bone destruction, we used a histological index based on microscopic inspection, assigning a score of 0-3 points for each joint (elbow, wrist, carpal joints, fingers, knee, ankle, tarsal joints and toes) with regard to synovial hypertrophy and to destruction of cartilage and bone. Synovitis was scored as follows: 0 = no synovial hypertrophy; 1 = mild synovial hypertrophy, consisting of up to five cell layers; 2 = moderate hypertrophy, up to 10 cell layers; 3 = marked hypertrophy, >10 cell layers. Cartilage and bone destruction were each scored separately, as follows: 0 = no destruction; 1 = mild destruction; 2 = moderate destruction; 3 = severe destruction; the scores for cartilage and for bone were summed to yield an overall score for cartilage and bone. The total index was calculated by adding all the scores within each animal tested. Bacterial samples were obtained as described elsewhere . Colonies were tested for reactivity to catalase (using 18% hydrogen peroxide) and to coagulase (using rabbit plasma with EDTA [Becton Dickinson Microbiology Systems, Sparks, MD, USA]). rleptin (R&D Systems) was reconstituted in accordance with the manufacturer's instructions, then further diluted in PBS to achieve the desired concentrations. IFN-γ and IL-6 were measured as described elsewhere . Leptin, TNF, IL-1β and IL-10 were measured using Quantikine mouse immunoassays (R&D Systems). Assays were performed in accordance with the manufacturer's instructions. The Mann–Whitney U test, the Wilcoxon signed rank sum test and Fisher's exact test were used to analyse the data. P ≤ 0.05 was regarded as statistically significant. Serum concentration of cytokines and bacterial content in tissues are expressed as means ± SEM. The serum leptin concentration before inoculation of staphylococci ranged from 1.0 to 8.0 ng/ml (median 2.5 ng/ml). Previous studies measuring leptin in C57BL/6 mice have found similar levels [16,29]. The serum concentration of leptin decreased during S. aureus-induced arthritis (Fig. 1a). This decrease was preceded by weight loss (Fig. 1b). Controls showed weight increases of 21 ± 2.8% during the experiment, with a median leptin level of 2.5 ng/ml at the end of the experiment. Leptin production also decreased in infected NMRI mice treated with rleptin (Fig. 1c). Box-and-whisker plots of (a) serum concentration of leptin; (b) weight change in C57BL/6 mice (n = 9), before and after inoculation with S. aureus; and (c) serum concentration of leptin in leptin-treated NMRI mice (n = 10) during S. aureus-induced arthritis (experiment 2). Boxes show the medians and upper and lower quartiles. Whiskers show the 10th and 90th percentiles. The highest and lowest values are plotted as circles. The Wilcoxon signed rank sum test was used to evaluate statistical significance. n.s. = not significant. The severity of S. aureus-induced arthritis was significantly decreased after the administration of rleptin (Fig. 2). The treatment did not significantly affect the frequency of arthritis at day 7 (67% in leptin-treated mice versus 84% in controls). Box-and-whisker plots showing the severity of S. aureus-induced arthritis in leptin-treated NMRI mice (n = 20) and PBS-injected controls (n = 20), expressed as arthritic index (experiments 2 and 3). Boxes show the medians and the upper and lower quartiles. Whiskers show the 10th and 90th percentiles. The two highest and two lowest values are plotted as circles. The Mann–Whitney U test was used to evaluate statistical significance. The destruction of bone and cartilage was not significantly affected by the addition of rleptin. At day 8, 89% in each group showed such destruction, and the severity score was 10 versus 16 (median, leptin-treated vs controls, n.s.). In each group, 89% displayed synovitis; the median severity score was 8 versus 12 (treated vs controls, n.s.). The leptin-treated mice had significantly lower IL-6 levels than the controls at day 1, before the differences in joint pathology appeared (1.1 ± 0.3 ng/ml vs 1.4 ± 0.1 ng/ml; P = 0.049). At this early time-point, the serum concentration of IL-1β was 5.2 ± 0.8 pg/ml, vs 4.6 ± 1.6 pg/ml (leptin-treated vs controls, n.s. ), and for TNF it was 21 ± 13 pg/ml versus 15 ± 5 pg/ml (leptin-treated vs controls, n.s.). Serum IL-10 was not detectable. Serum IFN-γ in leptin-treated and control mice was 473 ± 97 and 446 ± 145 pg/ml, respectively (n.s.). At day 8, no significant differences were found. Ten percent (2/20) of the leptin-treated mice died during the two 8-day experiments, versus 5% (1/20) of controls. No effect of exogenous leptin on weight loss was recorded, either early or late. At the end of the experiment, the mean weight loss was 18% in both groups. The load of S. aureus in kidneys was 2.1 ± 1.5 × 108 (leptin-treated) versus 3.7 ± 1.6 × 108 (controls; n.s.). In blood 24 hours after the inoculation of staphylococci, leptin-treated animals had 390 ± 151 colony-forming units per milliliter, vs 84 ± 36 for controls (n.s.). Six of nine leptin-treated mice and 8 of 10 PBS-treated controls had S. aureus present in joints (n.s.). This is the first report of a study of leptin production in response to bacterial arthritis. The leptin production was clearly downregulated during S. aureus-induced arthritis. Furthermore, this study is the first to show that the severity of arthritis is lower in leptin-treated mice than in controls. Before any ameliorating effect of leptin on arthritis was evident, a decreased inflammatory response was noted, as measured by serum IL-6 levels. Leptin has been shown to be involved in inflammation, both as its initiator and as a downregulator. The administration of rleptin induces production of proinflammatory cytokines, e.g. TNF , and directs a T-cell response into a Th1 type of response . Leptin is proinflammatory in case of initiation and progression of experimental autoimmune encephalomyelitis . In this study, we evaluated if leptin itself could initiate joint inflammation, but no signs of synovitis were seen when knees were exposed to microgram doses of the molecule (results not shown). Besides being an inducer of proinflammatory mediators, leptin may be induced by, for example, TNF and IL-1β. Since anorexia is one of the symptoms of murine septic arthritis, and the production of several proinflammatory cytokines is increased during the course of disease, we hypothesized that anorexia could be induced by increased leptin production during S. aureus-induced arthritis. Unexpectedly, leptin production was significantly decreased during S. aureus-induced arthritis. The decreased leptin production in mice with septic arthritis may mirror a decreased volume of leptin-producing adipose tissue. Interestingly, while weight was almost restored after the anorectic phase, leptin production stayed low, possibly reflecting a decreased volume of fat tissue. Previous reports on the correlation between leptin and arthritis are rare . Our data show that the administration of rleptin leads to a decreased severity of septic arthritis, indicating an anti-inflammatory effect. Leptin has previously been reported to exert a protective role against endotoxin-induced lethality, possibly mediated through increasing levels of IL-10 and IL-1-receptor antagonist  or through downregulation of TNF production . Leptin also mediates the protection of TNF-induced lethality . The proinflammatory importance of TNF/lymphotoxin-α and TNF itself for the development of septic arthritis has been described elsewhere . Potentially, exogenous leptin may exert its anti-inflammatory effect on septic arthritis through protection against TNF-mediated inflammation rather than downregulation of TNF production. Indeed, our experiments did not show any significant differences with respect to circulating TNF levels in leptin-treated versus control mice. The decreased production of IL-6 in response to exogenous leptin might be a possible pathway. Decreased production of IL-6 could be due to a downregulation of TNF, or, alternatively, could be a direct effect of leptin. There are some indications that leptin directly influences the production of IL-6. Macrophages from ob/ob mice display increased expression of IL-6 . Similarly, overexpression of superoxide and hydrogen peroxide is seen in macrophages from these leptin-deficient mice. These findings indicate that in leptin shortage, whether this is of genetic origin or due to induction of an anorectic condition, macrophages are overactivated because of lack of leptin control. IL-6 itself is an important proinflammatory cytokine in noninfectious arthritis , and decreased production of this cytokine might be an important anti-inflammatory pathway by which rleptin ameliorates septic arthritis. Additional anti-inflammatory pathways induced by leptin may include, for example, increased production of IL-1Ra . We did not find any differences with regard to clearance of staphylococci from the blood stream, joints or kidneys, though results in vitro indicate potential antibacterial effects of leptin either through increased phagocytosis [38,39] or through enhanced production of reactive oxygen species . The production of leptin is decreased during the course of S. aureus-induced arthritis, probably because of a vast loss of adipose tissue, which is the professional leptin producer. The administration of rleptin decreases the severity of septic arthritis without affecting weight loss or the bacterial load in tissues. The beneficial effects of leptin on the development of arthritis are preceded by downregulation of interleukin-6 production. While potent anti-inflammatory interventions, e.g. neutralizing TNF, might result in accumulation of staphylococci in various tissues during septic arthritis and potentially decrease survival, leptin might offer an anti-inflammatory regimen with less harmful undesired effects. This work was supported by the Göteborg Medical Society, OE and Edla Johanssons Foundation, Börje Dahlin Foundation, King Gustaf V 80 Years Foundation, the Swedish Association against Rheumatism, the Swedish Medical Research Council, the Nanna Svartz Foundation, the University of Göteborg, the A-G Crafoord Foundation. We thank I-M Jonsson, M Verdrengh and L Svensson for excellent technical assistance.